To customers around the globe, the SES team of engineers extends cutting-edge technology with an unparalleled comprehensive skill set. Our goal is to do whatever is necessary to ensure that your design and analysis requirements are met and your strict scheduling guidelines are followed. Our engineers can help with weight and cost reduction and design parts to be lighter and stronger. 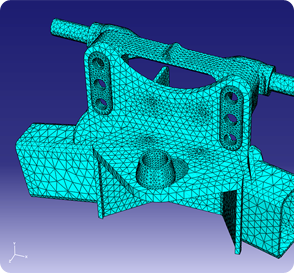 Our state-of-the-art finite element analysis software (FEA) process provides our customers with a large collection of linear and nonlinear analysis methods with wide material modeling capability. Thermal, structural, and machine analysis are just a sampling of what we can do. 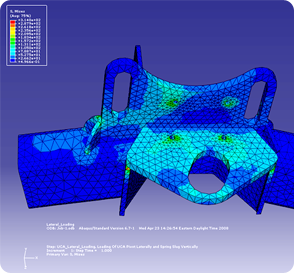 We can also leverage implicit solutions and a range of contact and nonlinear material options for static, dynamic, thermal, and multiphysics analyses. Multiphysics capabilities include such conditions as coupled acoustic-structural, piezoelectric, and structural-pore capabilities. FEA provides increased reliability, is a valuable time saver, enhances safety, and reduces material usage in the design stage. From the analysis, deflection from loads can be determined, stresses can be identified, and 3D stress contours can be plotted. By incorporating FEA into the design process SES helps companies build products that are more reliable and therefore more profitable. We are experienced in working with large OEM vendors and have experience in a variety of applications including military, industrial, commercial, and automotive industries. Stackpole Engineering Services is an economical source for quality design and finite element analysis services for your company. From concept sketches to CAD and FEA models, SES can complete your design projects ranging from weight reduction to complete designs. The constantly updated technologies at SES enable us to meet the toughest quality standards in the industry. Trust SES' design and analysis team to ensure your next project yields optimized results that meet your customized specifications.